If I wanted to add a series resistor by itself as a protection will it be okay? and also, my signal is already small, wouldn't adding a resistor attenuate it even more? Most circuits seem to have a capacitor, my signal is DC shifted upward (to avoid -ve voltage), wouldn't the capacitor remove that offset? Finally, if I wanted to use the diode clamping diodes, which diodes should I use (i.e 1n4148 or 1n4002)? If you amplified with an op-amp powered by 5V then it couldn't produce more than 5V output, so that could be your solution. Failing that, I think a resistor and a couple of clamping diodes would help. The resistor is to current-limit the clamping diodes. I don't think you need to worry about dropping the voltage through the resistor because the analog input is high impedance. I think the 1n4148 would be OK, I don't see why not. Use a voltage comparator to buffer the input to analog pin . E.g. a cheap lm 393. 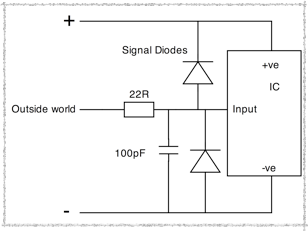 If the signal is less than 5v in buffer circuit is stored and passed on- if its more than 5v voltage comparator blocks the , more than 5v, voltage to the arduino. I know that Arduino has an internal protection circuit, will that be enough to combat those sudden movements? it depends on the voltage your pin may see. the pins have clamp diodes - the reset pins may not have, so check the datasheet for sure. those diodes can sustain some current - check the datasheet on that - absent of it, I wouldn't go more than 10ma on those little guys. So if you think you may see 10v on the input, put a resistor of (10v-5v) / 10ma = 500ohm resistor there, where 5v is (assumed by me) the supply voltage of your mcu - use the real figure if yours has a different supply voltage. the same calculation with the negative rail /ground. and pick the larger of the two. I typically put a 1k resistor there. I try to be careful if i need to go over 10k, especially for adc pins. a safer route is to use a (dual directional) buffer. but it does add cost + board real estate. Not the answer you're looking for? Browse other questions tagged arduino-leonardo analogread arduino-pro-micro or ask your own question. Arduino nano getting powered through analog input?